« THANK GOD “Ice/Age” – Experimental & Punk = Mainstream Avenue Is Closed Dammit! MANOWAR – Over the decades, when it comes to my favorite bands, the collector “bug” will always kick in whenever I come across CD singles, EP’s, picture discs, 7″ vinyl, etc. that have been released with their music. 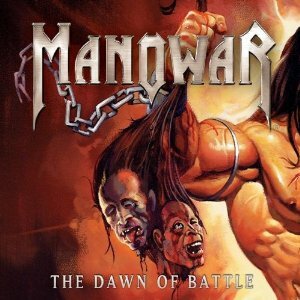 Manowar released The Dawn Of Battle EP or as it is also called, enhanced CD single, back in 2002 on Nuclear Blast. Magic Circle Music, (founded by Manowar’s co-founding member and bass guitarist, Joey DeMaio), is also the co-label. There are three songs, (The Dawn Of Battle, I Believe and Call To Arms) and CD-ROM bonus material on The Dawn Of Battle. My favorite out of the three songs is Call To Arms, it just thunders along with classic Manowar Heavy Metal power. There is nothing better than a heavy duty, psyche-out, Heavy Metal anthem to invigorate my Metal senses. Call To Arms supplies an ample dose of psyche-out splendor for me, with Eric Adams pronouncing each syllable of this song’s lyrics with a victorious Metal cockiness that he is so damn great at. I Believe is a song straight from the Manowar text book of personal power, strength and victory. The tempo is dictated by the rhythm section of Joey DeMaio on bass and Scott Columbus on drums. The sheer power that the Heavy Metal stomp of Manowar provides on I Believe, is enough to make my home stereo speakers shudder at their mountings. Hail Manowar Heavy Metal! The Dawn Of Battle is without a doubt, the fastest and Heaviest of the three songs heard on this EP. Eric Adams comes across with more vindictiveness on this song vocally, than on the other two songs. He does the near-spoken word at the mid-point of The Dawn Of Battle, which is characteristic. Manowar has a fabulous way of making their breakdowns feel awe inspiring. Guitarist Karl Logan is his excellent self on all three songs, providing plenty of melodic leads and ground shifting riffs. Oh yeah… how about this cover artwork for The Dawn Of Battle… damn, it’s brutally intense stuff! It’s MANOWAR. I make no apologies for digging it myself… Metal be thy name. * Call To Arms is also found on the 2002 studio album from Manowar – Warriors Of The World. I Believe and The Dawn Of Battle are found on Warriors Of The World “Gold Edition” as bonus tracks. This CD/EP also includes some very cool bonus material. There is a documentary, that lasts about 6 minutes or so, that features some behind the scenes footage of Manowar’s “Ringfest” performance from August of 2002. It has the sound engineer for Manowar, Jeff Hair, talking about how his responsibility to take care of the “live” sound details. The stage/equipment/instrument tech for Manowar who goes by the name of Dawk, also talks about how everything you see on a Manowar stage is “real” and put together by him. Dawk also states that Manowar plays at “7000 rms watts of power”… whoa, that’s power! It is mentioned that Dawk has been with Manowar since the early 80’s… since the beginning of Manowar. Jan Freitag, Manowar’s production manager, speaks on this documentary as well… only he speaks in a different language that sounds European to me, maybe German? There are snippets of “live” footage showing Manowar performing at this 2002 “Ringfest”, showing Joey DeMaio (bass guitarist) taunting the police that supposedly were called to shut down Manowar from performing… due to the “live” music being played too loud. It’s funny stuff to watch, as Joey DeMaio drops a bucket load of “F” bombs on the evening’s developments. Needless to say, this “Ringfest” performance by Manowar was not shut down by anybody. * A promotional trailer for the Manowar “Fire & Blood” DVD is also on this EP. It goes by rather quickly, lasting just over a minute or so. Still, it’s fun to have this stuff added to this EP… in my Metal opinion. * The “live production lighting animation” segment of the bonus material lasts no more than 30 seconds. It shows still photos of the different stage lighting and setups that Manowar used during their tours. It’s nothing to jump up and down about due to it being “still” photos changing over, nonetheless it is interesting to look at. It was fun to dig this Manowar CD/EP out and slap it into the computer to watch these bonus material segments, even if the running time on them was short. I definitely recommend this Dawn Of Battle EP to all Manowar fans… and Heavy Metal fans worldwide. This entry was posted on October 27, 2010 at 12:01 am and is filed under Album Review, hard rock music, Heavy Metal, heavy metal albums, heavy metal bands, heavy metal music, metal music, metal odyssey, Music, rock music with tags 1980's heavy metal bands, dawn of battle cd single, heavy metal albums, heavy metal music, heavy metal songs, manowar, metal music, metal odyssey, Music, old school heavy metal, rock music. You can follow any responses to this entry through the RSS 2.0 feed. You can leave a response, or trackback from your own site.